Areije Al-Shakar has 16 years of experience in banking and entrepreneurship. In her current role at Bahrain Development Bank (BDB), she is a Senior Vice President heading the Development Services Division and leads the fund management team of the Al Waha Venture Capital Fund of Funds (Al Waha Fund) (US$ 100 Million Venture Capital Fund of Funds) as Fund Manager. Her role and involvement at the bank includes coaching, mentorship, startup seed funding, and entrepreneur development. She has been involved in the development of several support services for entrepreneurs, namely her role in establishing BDB’s Rowad Program, a holistic entrepreneur support platform and SeedFuel-Rowad, startup funding program part of the Global Accelerator Network. 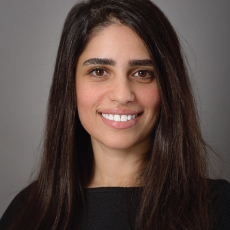 She has worked in reputable organizations such as Investcorp, Citibank, BNP Paribas and Lehman Brothers on the Treasury, Investment Management and Advisory side. She holds a Master’s of Science in Public Policy and Management, from the School of Oriental and African Studies (SOAS), University of London, a Bachelor of Commerce in Finance, from the John Molson School of Business, Concordia University, and is a Certified Business Coach and Mentor, from the Chartered Management Institute, UK.